Grand Theft Auto V may have come out on last-gen consoles over a year ago, and current-gen consoles just a few months ago, but PC gamers have been waiting very, very patiently to get their hands on it. Rockstar previously promised PC gamers that they would finally get the game on January 27, but a few keen-eyed fans noticed that the title's Steam store listing has had the January 27 date removed, and replaced with "Early 2015". Thankfully, when the issue was raised in the official Rockstar forums, an official Rockstar poster confirmed that the release date has not been changed. 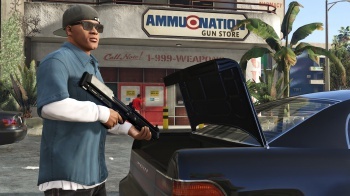 "GTA V will be coming to PC on January 27th. We have not announced any changes to this date at this time," posted Rockstar employee Scott E.
Now that Rockstar is finally delivering the game (albeit, over a year late), are you PC gamers still excited for it? To me, it seems like a case of too little too late, which is a bit of a shame, because I'm sure Rockstar will be quick to attribute the game's inevitable poor PC sales to piracy, rather than its lateness. That said, the fact that PC gamers are still actively playing GTA IV and making wacky mods for it does give me hope for the future of the latest installment.